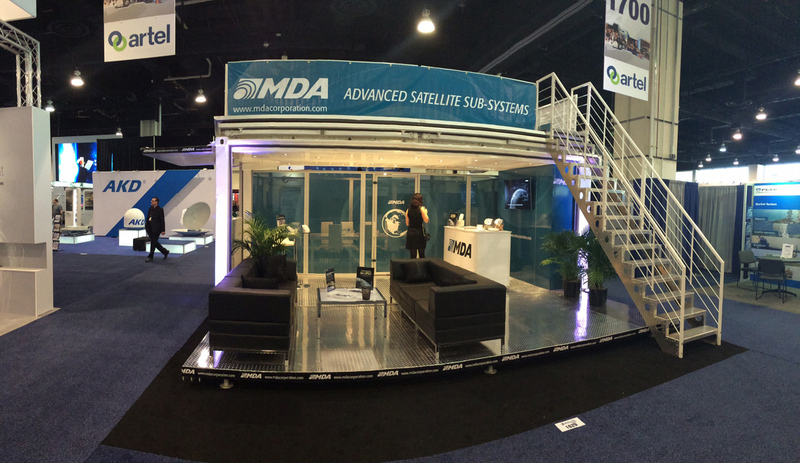 International satellite company MDA has been a convert to container repurposing for the past 5 years, for the simple reason that their cutting edge installation exerts an unseen force on convention floor crowds. Two thirds of the first level, outfitted with a semi-transparent screen in the company colors, is a public space dedicated to meeting customers, while the back third acts as a private conference room where presentations can be made and actual business can be conducted. A second floor open lounge area becomes the perfect entertainment and relaxation space high above the bustle of the conference floor. MDA is thrilled with its unit and how it seems to effortlessly become the center of attraction at any event.